Rabiah Hussain was born and bred in East London and her family are originally from Pakistan. She studied Politics and English Literature at undergraduate level and has an MA in Global and Comparative Politics. She freelances as a digital marketer to pay the bills but is a poet and playwright first and foremost. As a guest blogger for The F-Word in January, she is writing about the importance of intersectional feminism and how the current political climate is affecting women of colour. She wants to highlight why mainstream feminism needs to be more inclusive and why we must listen to the voices of marginalised women. As a British-born Pakistani woman of colour from a Muslim family, there are certain assumptions I face by people who make judgements about my life simply by looking at me or knowing the basic facts about who I am. Here are some of the statements (not questions) that have been said to me over the years, mainly by those who are not of my background. My brown skin has led to many drawing the conclusion that I must know how to cook. The truth is that I don’t know how to cook and do not have any remote interest in learning. Knowing that I grew up in a Muslim family, people make me an object of sympathy because that means it must be really difficult for me to fight for my rights. The truth is that yes, I may have had some trouble with faith, but neither has it been a hindrance to me nor been imposed on me by my parents. Along with this, I’ve been told many times that I’m really different because I don’t agree with suicide bombings or extremist views of any kind. Being a British-born Pakistani has led to people believing that I would have an arranged marriage by a suitor my parents choose, in which I’ll have no say since I am most likely to be a timid, quiet and delicate flower. The reality is that I am married to someone I met through a friend and who is of a different Islamic sect to me. I have no fear in defending my own choice of partner. Trying to fit into the white, middle-class world of work has led me to swing around from feeling inferior and isolated while suffering from internalised racism that took a long time to shed. Coming out on the other side, I’d like to put forward an observation: the bodies of Muslim women seem to send out signals that make people feel they have the right to stamp stereotypes and political ideologies onto them. This is a reflection of a broader mindset that female bodies can be used as some sort of battleground by people across the political spectrum. Last year, headlines reported the burkini ban across many European countries, with people such as France’s minister for women’s rights drawing a parallel with “American negroes who accepted slavery”. This is a clear example of white feminism ignoring the voices of minority women. The same can be said for groups such as Femen, who seem to believe themselves to be the liberal saviours of Muslim women without bothering to understand what these women stand for themselves. Ever since Brexit and Trump there have been multiple reports of the hijab being pulled off the heads of Muslim women by racists who prey on those they believe are unable to defend themselves. The deputy leader of the far-right party, Britain First, was convicted of religiously aggravated harassment for abusing a Muslim woman in a hijab. All the while their website and rhetoric accuses Muslim men and Islam of subjugating Muslim women. The irony of this is certainly lost on them. Nigel Farage has never shied away from calling a ban on the burqa due to it being ‘oppressive’ while using his politics to promote Islamophobia across the UK. Across the world, there are radical groups who seem to be an authority on what Muslim women should and should not wear, even if these women have never asked them to be. By no means exhaustive, this list demonstrates the ways in which the bodies of Muslim women are used in a political tug-of-war without ever giving them the platform to speak for themselves. Muslim women have been painted as victims and therefore they are easy subjects used to further the political stance of whomsoever desires. With these prejudices so deeply entrenched in our societies, progress will always be denied to Muslim women unless we realise that they can speak and make decisions for themselves. I know fiercely independent and successful women who choose to wear the hijab as a symbol of faith and identity, not because somewhere in the background a man has ordered them to. The burkini is no different to choosing the kind of attire you feel the most comfortable with at the beach – be that a bikini, a one piece or a wetsuit. As with women of colour in the west, Muslim women in Islamic countries are navigating the fight for equality by balancing their culture, religion and individuality and do not need white women to bare their breasts on their behalf. This is nothing more than white saviour complex. At a time when the political climate is increasingly hostile toward Muslims, the fight to protect the bodies of Muslim women from the opportunistic politics of all spectrums of society needs to come from Muslim women themselves. They have beliefs, passion and voices and they need to be heard. 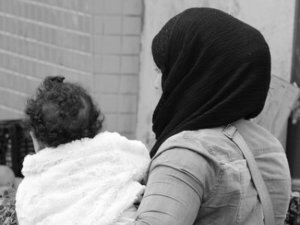 Image is of the back of a Muslim woman’s head and shoulders as she carries her child. She appears to be wearing a hijab. The image is black and white.